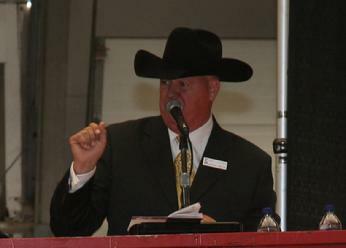 Available as an Auctioneer for your upcoming auction of horses or cattle. Bilingual in Spanish as an Auctioneer and currently eligible, either through licensing or exemption, in the 46 States listed below. Specializing purebred livestock sales. If planning a production sale, not knowing exactly where to begin or just simply lacking the time or energy, you may consider a total management program of sale prospect selection, advertising and catalog production, professional staffing, sale site preparation, catering, clerking, accounting and disbursement. You may have the manpower, time and/or expertise to produce your own auction but would prefer professional guidance to assure the most bang for your buck. A variety of Consultation levels are available each specifically tailored to fit your individual needs. I can't recall my first ride on a horse, they have always been a huge part of my life. Horses are actually indirectly responsible for my career as an Auctioneer. 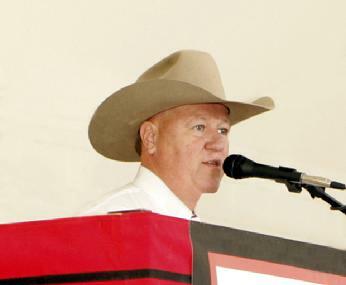 As a youngster, I became acquainted with Hall Of Fame Auctioneer, Col. Ike Hamilton. Attending horse auctions growing up and watching Col. Ike apply his craft piqued my interest, along with his persistent encouragement to attend his Superior School of Auctioneering. In 1978, while in college, I took the leap of faith to become an Auctioneer, at that point certainly not realizing my life would be changed forever. Today, 34 years later, the journey has been a memorable ride. 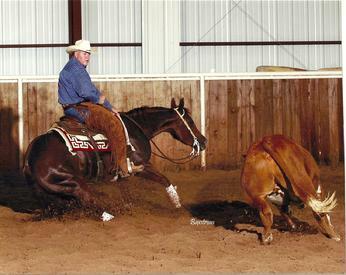 Horses and cattle remain a huge part of my life and I've enjoyed a fruitful career in the auction business . 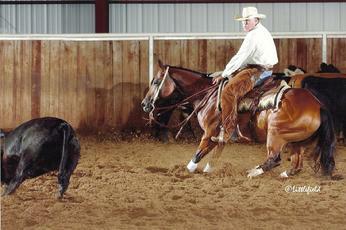 We breed, raise, train and show cutting horses, like the two pictured to the left. Those mares are now an integral part of our broodmare band. I've been a Finalist of every major NCHA event including the World Championship. Additionally, I'm a 4A NCHA and AQHA Judge, the highest rating. In short, I'm in the business, everyday, 365 days a year. So when I step in the auction box and behind the mic, you get more than just an Auctioneer, you get an Auctioneer with a vast knowledge or horses and cattle that lives it everyday and always has. Although cutting horses are my passion, I've served as Auctioneer for the AQHA World Championship Sale and the All American Quarter Horse Congress Super Sale of halter and performance horses; Billings Livestock Commission Horse Sale known for its great ranch horses; running bloodstock at Heritage Place in Oklahoma City and of course, cutting horses during the NCHA Futurity in Fort Worth. I've also conducted auctions for associations like Professional Bull Riders, Texas Quarter Horse Association and countless leading breeders of quarter horses. Along the way I've sold horses, cattle, sheep, exotic animals and western art. In planning your next upcoming auction I am available as Auctioneer, Consultant or can provide complete Auction Management. I'm biligual in Spanish as an Auctioneer and currently eligible, through either licensing or exeption, to sell livestock in 46 States, as you see listed below. Contact me to personally discuss what you envision for your auction and the array of options I am able to provide you.